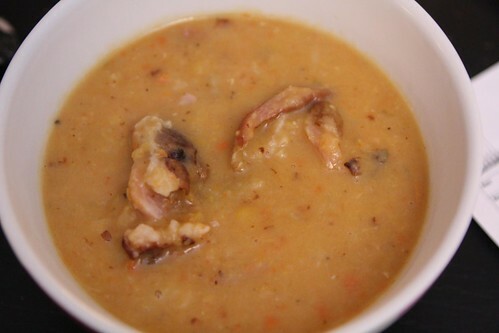 On our recent Lentil Lundi I was in a lentil sort of mood so I also put together a split pea soup because I knew Tuesday would be busy and this would be a nice quick dinner. 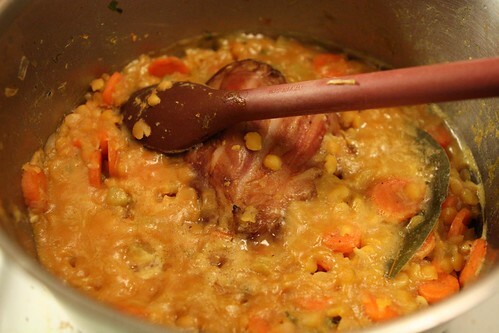 I started by cooking some onion, garlic, celery, and carrots in a little butter then tossed in some yellow split peas, a bay leaf, a smoked ham hock, the remaining chicken leek stock, and let it cook for a couple of hours. Then Tuesday, Wednesday, Thursday, and Friday got away from us and brought us to tonight where it was finally time to have some of this soup from the fridge. They say that soup is always better the next day. If that was the case then by my calculations tonight's meal would have been 500% better than if we'd enjoyed it on Tuesday! Math has never been my strongest subject. The soup did turn out quite well. Despite the lengthy cooking time the peas were quite "toothsome" according to Jen. I was surprised by this as well. Traditionally I suppose I should have pureed half the soup then added it back to give it a little more of a broth however I've never been one for tradition. I've always been a much bigger fan of laziness. 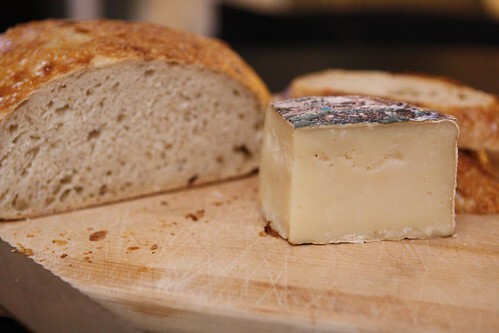 My local cheese monger recommended this Queso de Vare, a hard goat milk cheese from Spain as an accompaniment for split pea soup with ham. If you are looking for a cheese to pair with split pea soup (the odds are probably low) I'd get behind this one. Great stuff. 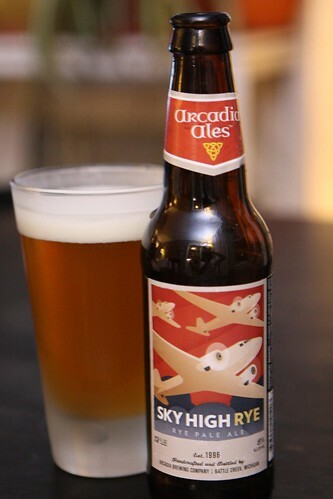 I decided to be brave and have my first beer in about a week with this Sky High Rye from Arcadia Ales. Their website is listed as currently under construction and if that means they're too busy making beers like this to update it then that is just fine with me. This beer was extremely delicious, loaded with lots of floral hoppiness and a nice soft bitterness that was a nice complement to the smoky pea soup. I don't think I've ever had a Rye beer before, surprisingly. If this is any indication of how good they are I just may have to start buying them more often. That is, of course, after I've gone through the fifty-some-odd beers in my overflowing beer cellar. I wouldn't want to be wasteful. Or get yelled at by Jen. Cheers!